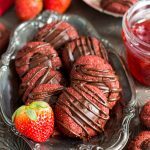 Fluffy and pillowy heart-shaped homemade marshmallows made with fresh strawberry puree, and dipped in semi-sweet chocolate! 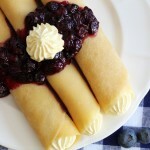 These are pretty, clever, and sweet! A perfect gift for Valentine’s Day! 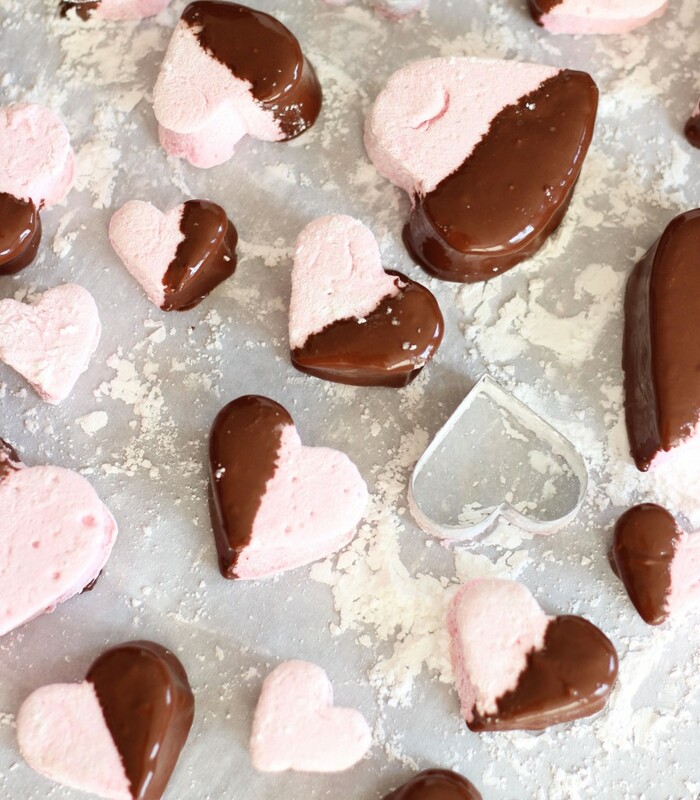 These cute and sweet Chocolate Dipped Strawberry Marshmallows are such a fun way to ring in Valentine’s Day. As I was telling you earlier this week, S.O. and I aren’t really into celebrating the holiday itself – I get more excited about the baking and the treats! Homemade marshmallows aren’t hard to make, but they are definitely messy. At least, they can be. As you can imagine, the marshmallow mixture is very sticky before it sets. Sometimes it becomes almost like a big web. The marshmallow connects to everything in its path and you keeping grabbing more utensils to manage and wield it, but suddenly you have a big bowl of spatulas and utensils, lost forever in a ball of marshmallow. However, this recipe for homemade marshmallows is as fuss-free as you can get when making candy. They aren’t at all messy, and the marshmallow mixture spreads super easily into the pan. It was a cinch to work with. Marshmallows are just so fun to make. There’s a particular novelty about them that’s hard to explain. They become ‘something’ out of almost nothing! They’re just especially fun, and it’s saying a lot that I enjoy this marshmallow-making process because I’m normally terrible at candy-making. Pureed fresh strawberries get mixed right into the marshmallow ‘batter’. The real strawberries keep the flavor true and authentic… because it is true and authentic. The marshmallows taste like fresh strawberry clouds of sugar dunked into silky and rich chocolate… because that’s what they are! 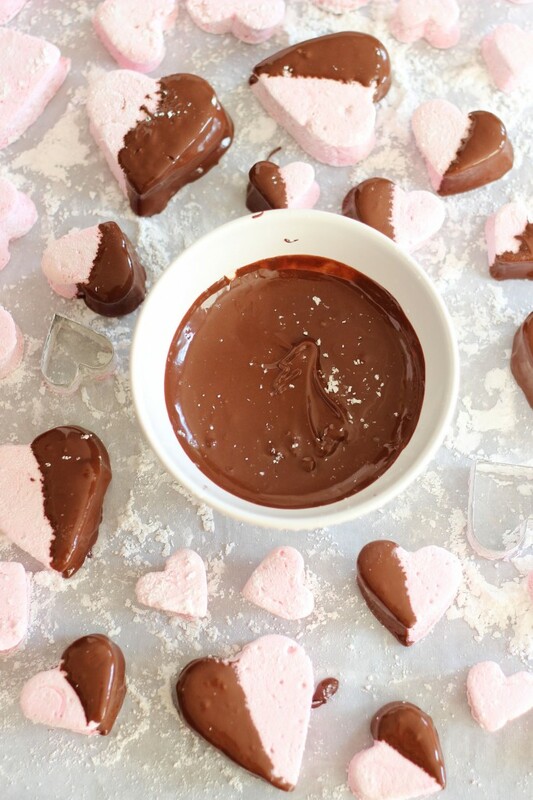 These Chocolate Dipped Strawberry Marshmallows are delicious and simple, and your valentine will totally thank you for sharing these cute treats. My only regret about these marshmallows is that I didn’t put sprinkles on them. Seriously, what was I thinking? Where are the sprinkles? Clearly, I was off my game. My sincerest apologies. 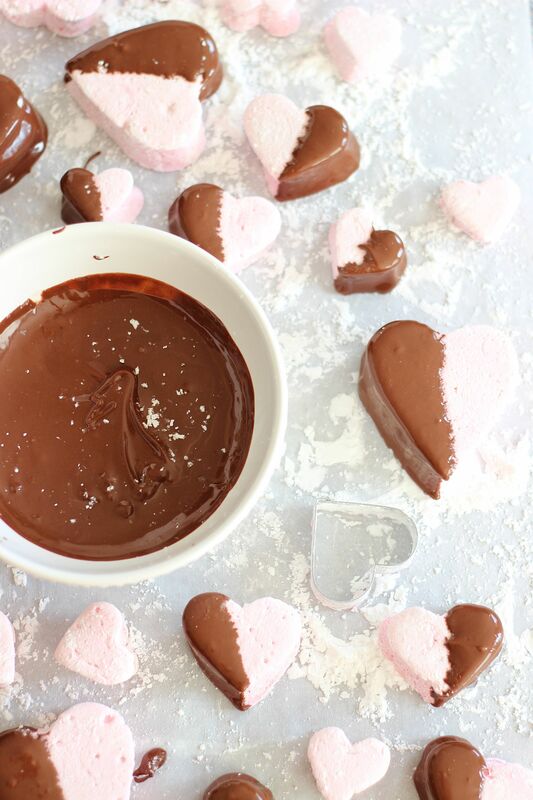 When you make these to share with your valentine, put some pretty sprinkles on top of the chocolate! Other than that, they are perfection! These are so freaking cute!! 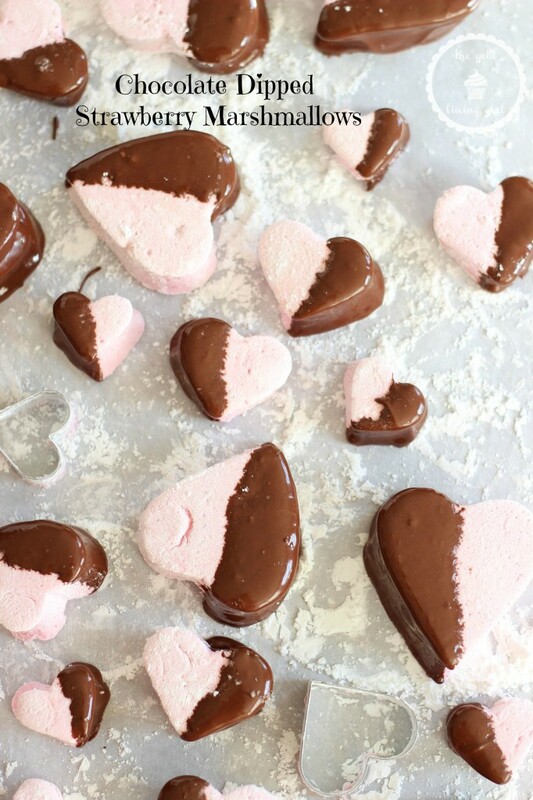 Love the heart shapes and of course the fluffy marshmallows!!! Thank you!!! They were fun to make! Aren’t marshmallows really fun? I saw your Coconut & Blood Orange ones – SWOON.They’re gorgeous! These are so so pretty! I love how fluffy and light they are and the pink heart-shapes are so adorable! Oh my gosh, these are absolutely gorgeous! 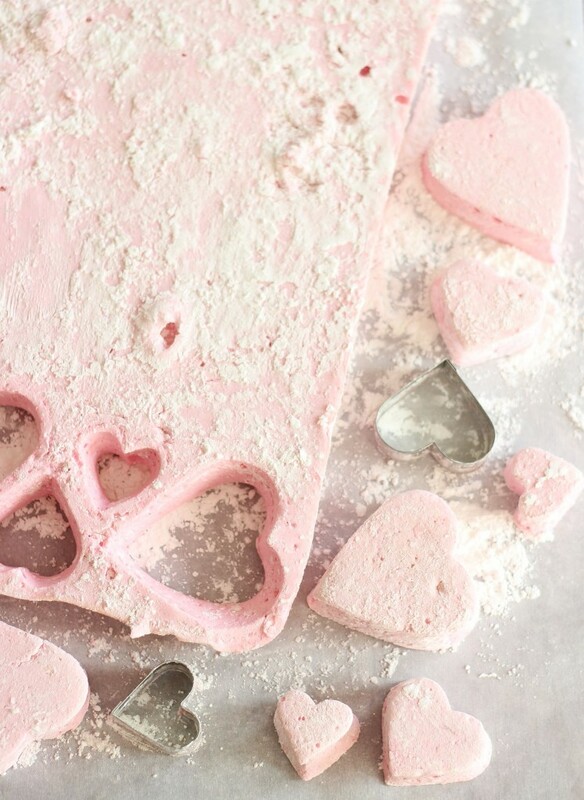 I love the idea of creating strawberry marshmallows! And dipped in chocolate is so creative. Such a fun treat for this time of year. Love!! 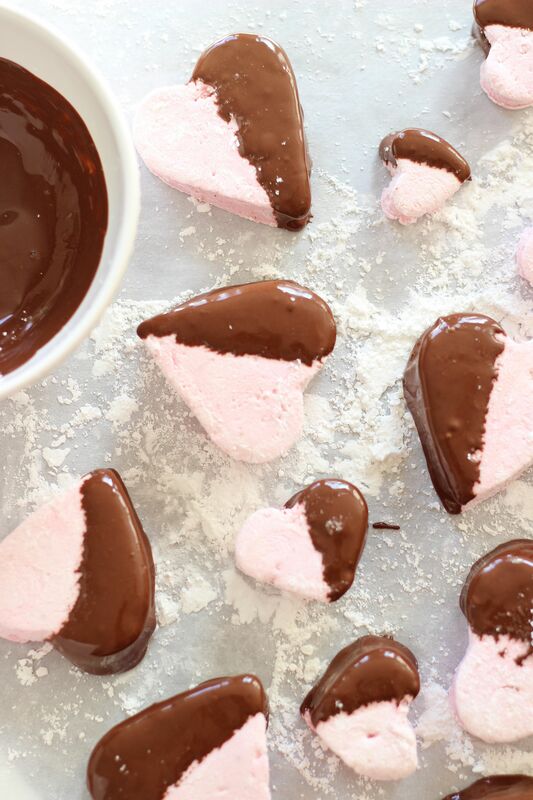 How adorable are these chocolate-dipped marshmallows! i still haven’t made marshmallows at home yet, but I definitely need to try now! Definitely! 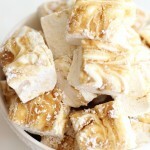 Homemade marshmallows are really fun to make and so much tastier than storebought! They’re delicious! I’ve never made marshmallow before. 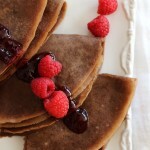 These look so soft and pillow-y, I’m afraid I’d eat them all while making them! Lol! That is a job hazard, right? I always feel that way too – I want to eat it ALL! OMG so so cute!! love how fluffy these look Sarah! Awesome, pinning! Haha! Thank you so much, Manali! They were really fun to make! Yowza! 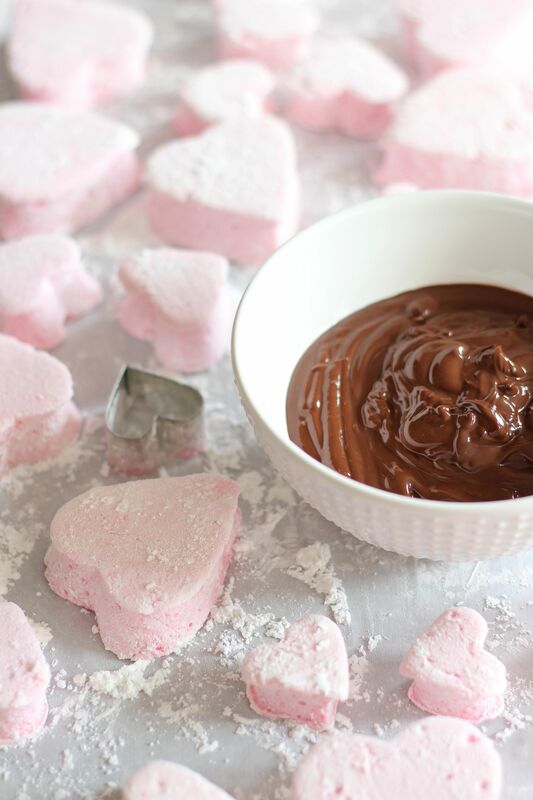 I have made marshmallows at home before, but never pink heart chocolate ones! I don’t think you needed the sprinkles. They are beautiful just as they are! Haha! WHHHHY didn’t I put sprinkles on them?! They are still pretty cute though. Thanks, Cyndi! These are the prettiest ever marshmallows! 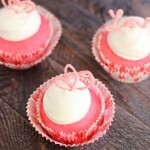 So cute for Valentine’s Day or floating in a cup of cocoa! Thank you so much, Cynthia! That’s a great idea!!! That would be delicious! LOVE! They’re so cute! And it doesn’t get better than homemade marshmallows! Oh yum! These are so pretty! I have never made homemade marshmallows! I will have to try it! Thank you for sharing on Show Me Saturday!